Picture taken from the Mini Mesa Vortex Vista and looking out over the city of Sedona, Arizona with Capitol Butte, apart of the Thunder Mountain, towering in the background. 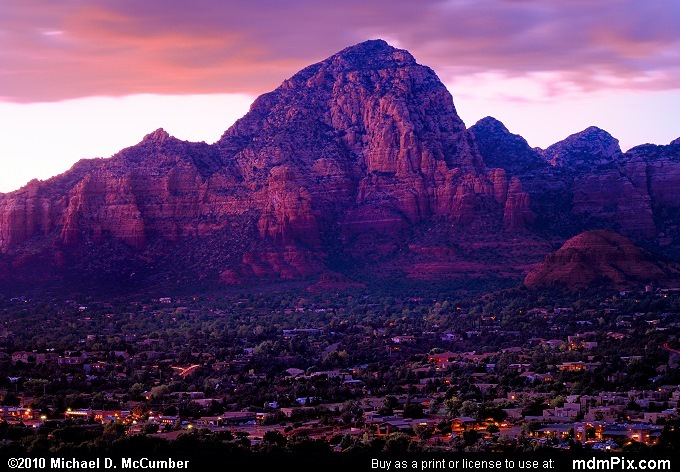 The red Schnebly Hill Sandstone face of the butte capped by a white Coconino Sandstone are what makes Sedona one of the most scenic cities in the nation. The city's lights sprawl across the valley while the sky is still lit from an afterglow of the recently set sun.